Sea Lions, Penguins and Seals... Oh my! Following on from Buenos Aires, the newly appointed Team Liability, now consisting of myself, Jules, Dan, Naomi and Hermie (a stray kiwi we picked up in Pamplona 4 years ago and have caught up with around the world ever since) headed south to Patagonia. The first port of call was a little town called Puerto Madryn on the east coast of Argentina. The town itself is not that great, but it did have the first beach I´ve seen in many, many moons, and a great little hostel called Che Patagonia Hostel. Small and homely enough, the real draw card was the 44 gallon drum that had been converted into a BBQ in the backyard. After much trial and error with the coals, our resident BBQ chefs Dan and Hermie finally managed to cook up some more of the awesome Argentinian steak, without managing to burn the hostel down. The real reason for the stop in Puerto Madryn however was because it´s the gateway to Peninsula Valdes, a UNESCO World Heritage Site and the home to many sea lions , elephant seals and fur seals. We took a tour to the Peninsula to visit all such animals, as well as a few stray llamas and an awesome little armadillo. He was a little nuggety thing, like a small armoured tank on legs, scuttling around the carpark. Definitely the highlight of the day. The following day we hired a car and drove about 4 hours south of Puerto Madryn to Punto Tombo, the largest penguin colony outside of Antarctica. So cute! You can walk among the penguins (although are under strict instructions from the rangers not to touch. Very hard when there are baby penguins waddling around!) and they just toddle around oblivious to the people around them. On the way home from Punta Tombo we stopped into Gaiman, a supposedly cute little town full of Welsh tea houses. The guide books lie! Gaiman is a waste of time and not worth the extra 40km, trust me! From Puerto Madryn, we headed west to El Chalten and El Calafate. 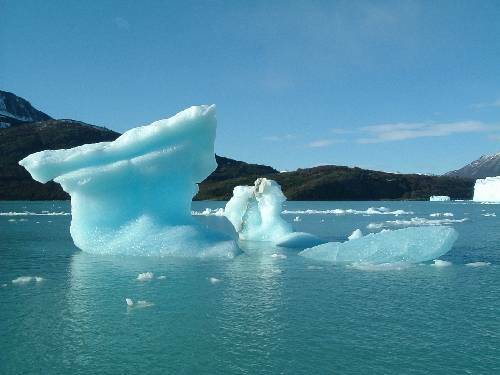 El Calafate has little to recommend it bar the fact that it´s the closest town to the incredible Perito Moreno Glacier. I can´t do it justice without the pictures, and I can´t seem to upload pictures at this internet cafe, but it was amazing. A sheer face of blue ice stretching back up the glacier as far as the eye can see. We hung around nearly 2 hours to watch a big chunk of ice fall off the face into the lake with a huge crack that echoed around the surrounding hills. El Chalten, while lacking many of the facilities available in El Calafate (eg an ATM), was a much nicer town. It´s a slow moving hiking town, filled more with outdoor adventure stores than restaurants and souvenier shops. We went on an easy 3 hour hike to Chorillo del Calto waterfall the first day there, saving ourselves for the mammoth 12 hour hike we had booked the next day.The hike was with an organised tour (thank god, navigation is not my strong point) out to Galcier Torres and Glacier Grande. The hike included passing the base camp for a nearby climbing spot, Torre d´Agostini, a zip trek over Laguna Torre and once we got to the point the glacier converged, a hike over the glaciers with crampons and we all got a go at ice climbing. Incidentally, crampons are the most fun shoes you can ever wear! So grippy, you almost feel like spiderman climbing around the ice. And at the end of a 12 hour hike, back at the hostel, you feel like an 80 year old spiderman with arthritic knees. The following day was (thankfully?) a torrential downpour so we rested weary legs and stayed indoors all day playing cards and drinking with some new friends found at the hostel. Our last day in Chalten, with 2 soldiers still injured from the pervious hike, the 3 members of Team Liability still standing set out on another hike up to the base of El Chalten´s real draw card, Mount Fitzroy. Sadly, Fitzroy was feeling a little shy that day and we never really got a clear shot of the face of the sheer granite rock face but the hike was beautiful all the same. The last 500m of the climb is unbelievably steep and nearly sucked the life right out of me, but the view of the lake at the top, just below the mountain just about made up for it.